Renault have been very quick introducing new bits on its R29 contender, and part of their rear end update at China was a heavily revised sidepod ending. 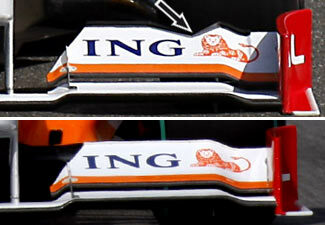 In sharp contrast with version seen at the launch, the new sidepods have more openings to provide extra cooling. As such the team could slim down the bodywork quite a bit and ditch its undercut hot air channel between the rear wheels. Apart from a whole range of changes on the rear end of the car, Renault have also changed their front wing to be more efficient. 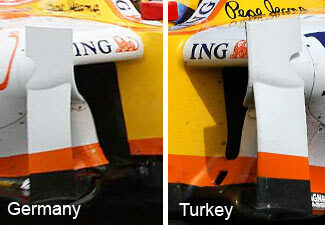 The above detail image is the new Shangai version for Alonso, while the lower one is that used in the 2 earlier races and by Piquet at Shangai. The latter will undoubtedly soon also have this update once the team finish manufacturing of a second one. 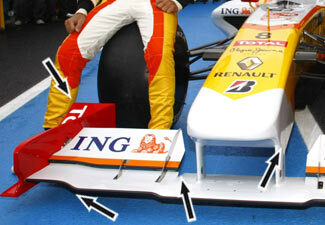 Is Renault R29's new nose illegal? 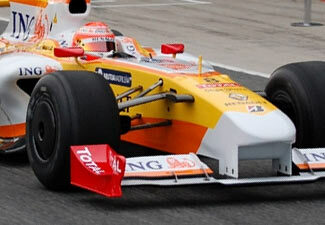 Just two weeks after the initial tests, Renault has already introduced a modified nose cone, building upon the foundations that were laid out at the launch. 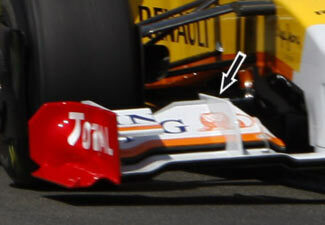 The tip of the nose is now a little more rounded to reduce drag. 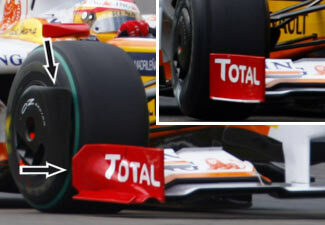 The underside however now sports 'side skirts' all along the sides of the nose, in between the front wheels and extending to the splitter. 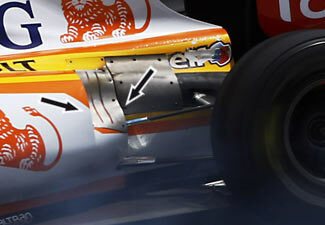 The new design will help even more to benefit from the low pressure area underneath the nose. 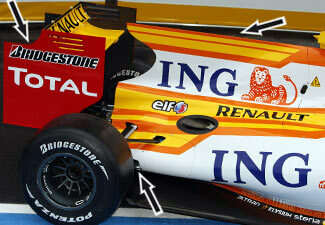 The newly launched Renault stunned many fans and experts because of its chunky nose. While it is arguably not aesthetically pleasing, it is this kind of creativity coupled to efficiency that make Formula One to what it is today.